The whole title of this post is… Why I’m not afraid to make decorating mistake and why you shouldn’t either! 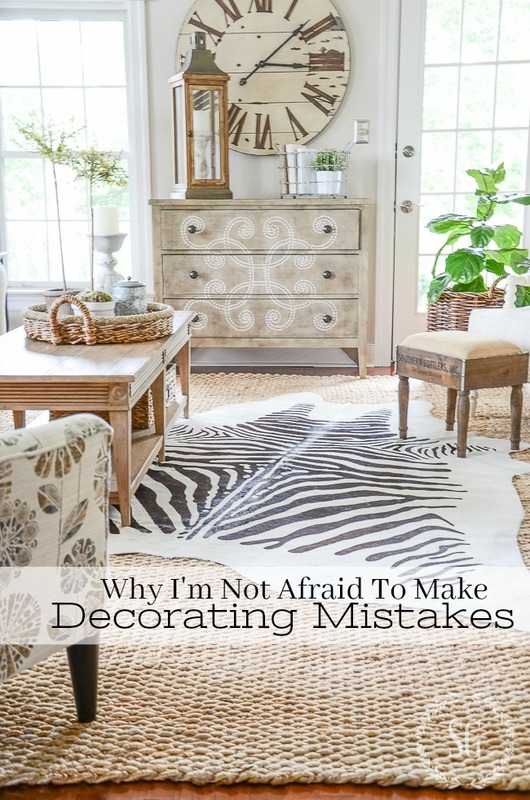 Today is PRACTICALLY SPEAKING and I want to have a heart to heart talk about why home decorators like you and me should not be afraid to make mistakes when it comes to decorating! And believe me, I am talking from experience. Let’s talk frankly about why many times a mistake is our best teacher and how not getting it right the first time hones our style and decorating acumen! 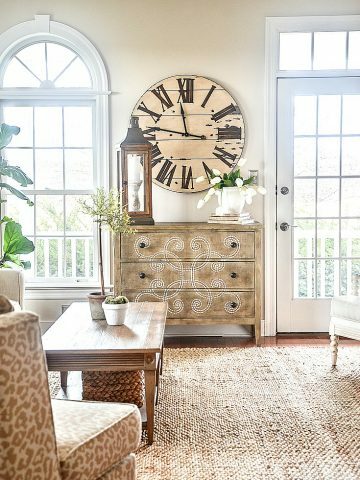 It’s a time we can get down to the nitty-gritty of home decor, which is one of my favorite topics! And I am so hyped to talk about today’s subject! 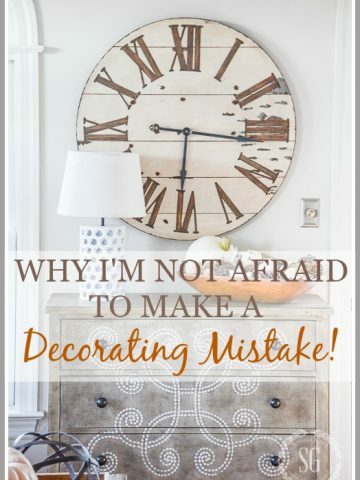 I think, and this is not scientific, that fear of making a mistake drives lots of home decor enthusiasts not to update and change things in their home. I call it FEAR OF DECORATING… FOD! Even more than money, I think many home decorators get “stuck” because they are afraid not to get it right! And that fear causes many of us not to make decisions about painting, covering, making and buying new things for our home! Raise your hand if you agree! Yup, I thought so. My hand used to be raised too! Shouldn’t we should love our homes and make them the best they can be! And that mean updating and sprucing up and changing things as they get worn and very dated! It’s all about loving our home and loving what we live with! I’m not talking about being frivolous or having a buy, buy, buy mentality. I’m talking about why we don’t want to make even the wisest and most needed changes in our homes! Why we get “stuck”! Let’s talk about mistakes. I try to be fearless when it comes to decorating. I love to take risks. 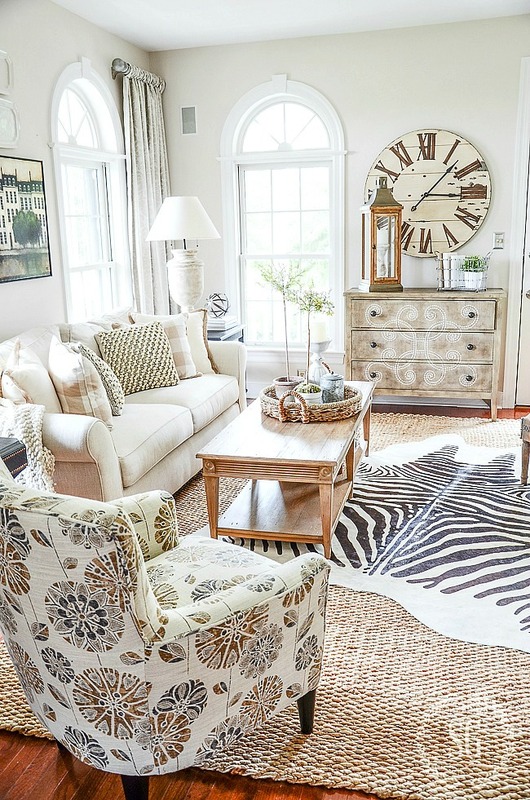 How many people would put a zebra rug in a farmhouse, right? Do I always make the perfect decisions? Goodness, no! I have made so many mistakes. Big, giant decorating mistakes! Like the time I painted my study and back stairs Pepto Bismal Pink! Or changed my home to look like a Tuscan villa. I call that my “Tuscan” phase! I’m made some real bloopers! And I still do! But each mistake was a great big learning experience! I learned that you should check how terracotta paint color looks in a room with very little natural light before you go away for the day and let you husband paint it. I learned that paint does not look the same on walls as it does in the can or on the paint chip the nice people at the paint store give you. I learned that after I cried about working in a room that looks like the inside of a Pepto Bismal bottle that I could eventually laugh… and laugh until I wet myself just a little! I also learned that I could fix it! Yes, it took time and a little money and sweat equity… but it makes a great story and boy I learned about paint color! I still think choosing a paint color is difficult but the search for the perfect color is well worth it. My bright pink walls taught me a very, very valuable decorating lesson! I really loved the Tuscan colors of the 90’s and went crazy painting and sewing and acquiring lots of red and gold furnishings and home accents to work with Tuscan sun colors! But in my heart I knew that I lived in a farmhouse in Lancaster County Pa and not in Tuscany! And no matter how much I loved those warm colors I was not being true to the style of my home! Nor to me either really! I bought into the popular style of the day! I chose to follow the decor crowd because I was not confident about my own personal style yet. 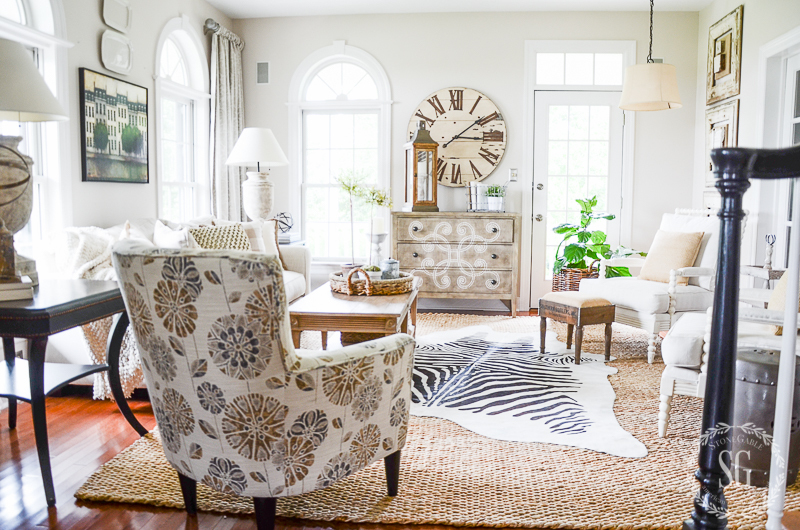 But out of the “Tuscan phase,” I learned a huge lesson that made the biggest difference in the way I look at my home… it was way more important to live with what I love than to fall into popular trends! My farmhouse screamed to be set free of its dark gold walls! I could almost hear them sighing with relief as I painted them Sonnet, a gorgeous neutral that they still wear today! I covered brown and red chairs with white duck cloth and saved for a new sofa. I added an inexpensive jute rug to the family room and spray painted red pottery creamy whites! I collected white dishes and planked a wall or two. My home is happy and it is its authentic self. And I’m much happier too. Along the way, I began to understand my style much better. If I want to get trendy (and I must admit I love new trends) I make or buy inexpensive accent pieces to scratch my trendy itch! Remember that trends come and go. It’s fun to add a little bit of edgy trend to our homes to keep them fresh, but we should not make an investment in them! Mistakes not only teach us the biggest decorating lessons and help up learn and pinpoint our style, but they also can be fixed, most of them anyway! Most decor mistakes are not something you have to live with forever! You can repaint a wrong color, return a lamp that does not work, send back a buffet that is too big and cover a great chair who’s fabric is not right. Yes, it does take energy and time. But remember you are becoming a better home decorator with a great eye for what will work in your home! When it comes to things like flooring and custom furnishing I tend to be a little more careful. They are large investments and often cannot be exchanged. Maybe I’m a little conservative, but I usually chose very classic styles in neutral colors that will last a long long time! This is part of MY style! You will have to decide what you are comfortable living with for a long long time and then GO FOR IT! Don’t get “stuck”! Don’t be afraid. Start with one thing and DO IT, COVER IT, PAINT IT, CHANGE IT OUT! You will feel exhilarated! And your home will look more like the home of your dreams! Be creative, be resourceful and have fun with your home decor! 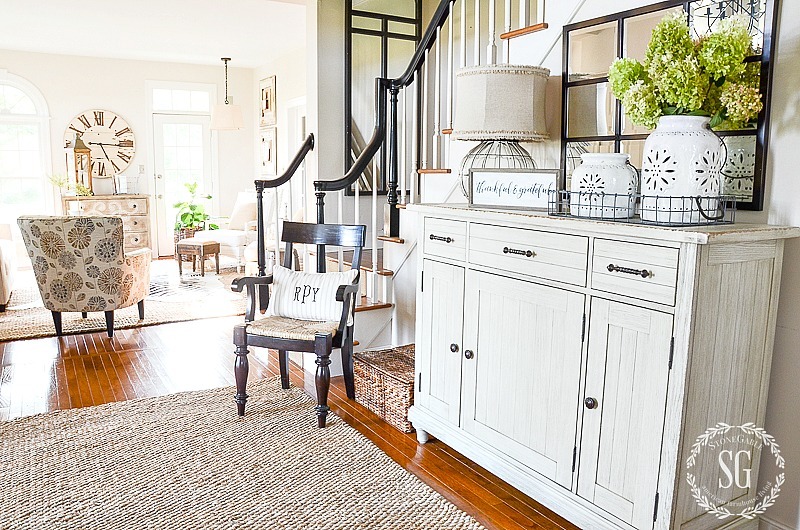 I hope this little Practically Speaking post has encouraged you and makes you a little more daring to push through your decorating fears to start creating the home you love! 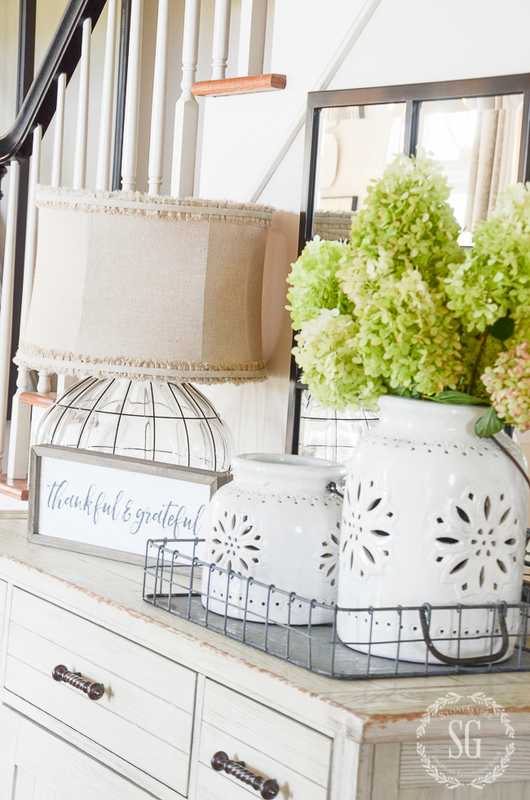 Let’s talk and share with one another about our decor successes and pitfalls today! Please feel free to interact with others but be nice! We are a community and we should be responding to others! Can’t wait to hear from you today! I love the dresser and that huge clock behind it. If you don’t mind me asking where did you purchase the clock. Your home is absolutely beautiful and your talent of decorating is a blessing. 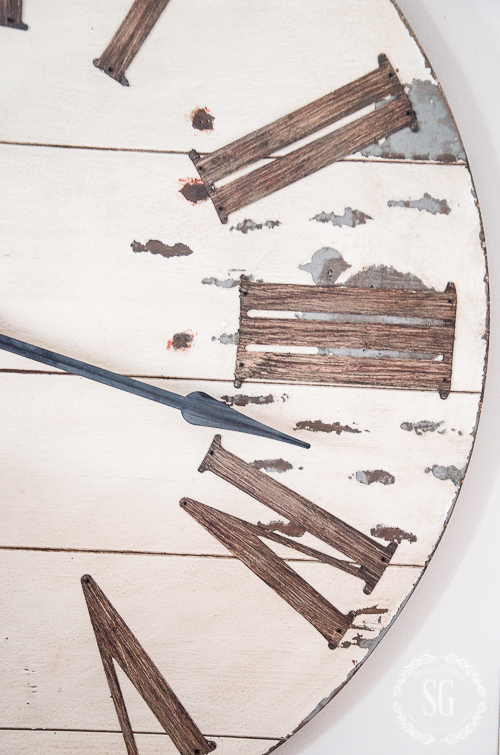 You can find the clock on Ballard Design. I once painted my large laundry room Hershey bar brown. GROSS!! Kinda killed my love of chocolate for a while. I built my first home in 2003 and sponge painted every wall in the house. It’s fun to look back at trends and laugh. Your post is so right on the nose! I have to tell you about my own decorating adventures. I’ve been a homemaker for 10 years, and lived in this house about the same amount of time. When we moved in here, the decor was HIDEOUS. Seriously. Orange carpets, 70s yellow linoleum, grandma wallpaper (no offense to any grandmas out there). Oh, and the ceiling in the dining room was white with gold paint splashes!! It was just bad. But I was too afraid to do anything to it because I didn’t trust myself or even know what I wanted to be honest. Then I started cutting out pictures from magazines of homes that I liked and pasted them into a notebook, and I slowly started to understand what I liked in a home. About four years ago, I finally took the plunge and did a total remake of our downstairs! I put in light neutral carpet, painted the walls a soothing tan color, painted the elegant craftsman trim (that used to be the same color as the wall before so you could hardly see it!) a shiny white, painted the gold ceiling white! Then on top of all those soothing light neutrals, I added some colorful country accents. I just love it, but it took a lot of looking inside myself and a lot of guts to bring it forward! I hope your post helps inspire someone else to find their own beautiful home! Oh I can relate! I fell in love with the Victorian era (remember Victoria magazine)? I had florals everywhere. My poor husband was a good sport about it. I finally started replacing all the roses with neutrals and I still love antiques but the heavy, dark ones? Um, no. I don’t like dark spaces. Give me bright light-filled rooms any old day. I’m finally decorating for who we are, not for some trend. (Yep, fell into the farmhouse one too but finally realized while I like the look, it’s really not us. I have a few touches as they fit our causal, comfortable style). I think we have to make those mistakes to figure out what we like or don’t like and that’s ok as long as we can move on when needed! You are so right Cecilia! This has been such a fun post to read as well as all the comments. I am struggling over which fabric to recover 2 Berger chairs. I know I should just put the new Crypton fabric in a light beige on them (it protects against dogs and grandbabies), but I love the tone on tone fabrics with a pattern. It made me feel better to see that others struggle with making a decision too. I see you are getting another bout of cold weather! Burrr! One more chance to enjoy one of your delicious soup recipes! Have a blessed week. Loved this post! Yvonne, you tickled my memory of a paint decision gone very bad several years ago. In our previous home the half bath had dark teal, heavily (note that I did not say ‘heavenly’) floral wallpaper. Down it came with the excitement of painting it a beautiful light aqua. Huge problem. Got the project completed, and for the life of me, it was as though I was hyperventilating when I went in there. For some reason I felt like I was drowning. I needed suggestions. Had a friend over whose design sense I respect. She walked around the house and down in the basement she spotted a large framed print that was my grandmother’s…a vessel overflowing with peonies. “WHY IS THIS DOWN HERE AND NOT ON A WALL? !” She knew immediately where it needed to be hung AND what color the bathroom needed to be. So we repainted it the garnet red she suggested. Golly I loved that powder room! A couple of years later we sold the home and the buyer gushed over that little bathroom. It was one of my happiest do-overs e-v-e-r. I had not thought about that in a long time so thank you for helping me realize that sometimes the sweetest memories do come with extra effort. Have a blessed day!! Have you ever watched I Love Lucy? It ran for awhile and it showed trends in furnishings of the 50’s. I watched old Leave it to Beaver shows to look at the design and found how both these shows dealt with trying new decor and making mistakes! And making wonderful choices too. I have a small home with five windows in the great room. It has vaulted ceilings on two sides so these window coverings are my “art” There’s not so much wall space! I like color so I’ve used less expensive window coverings as my way to switch up my look. I’ve found West Elm to have great prices so I’m off to a totally new look. Yes wallpaper on a kitchen vaulted wall is in the future. I saved to make minor changes. If we really don’t like it? We will save to change it. But I truly believe it takes determination. My biggest critics I’m trying to learn that I need not listen to their criticism. Oh a funny thing about the Peptones Pink walls. Maybe even brighter. I knew someone who did that in a bedroom and then had a job transfer. There was a bit of a bidding war over her house. She never repainted any of her bold paint choices. The family who bought the house said the pink bedroom was a selling point as their little girl fell in love with that room!! Smile!!!! YOU GO GIRL. You are a girl after my own heart… and decorating hutzpah! Yvonne, you make me smile as you are so authentic !! So real and so truthful!! I have made and still make a lot of decor mistakes. Part of my problem is I get complacent with what is..that is why your blog is so important to me. You pose ideas and experience that makes me take a second look and rethink my home. I am forever grateful! Blessings to you! I loved your paint story. We just had an addition built onto our small ranch style home and when I picked out the color for the powder room, I thought I had chosen a light sage green. Imagine my dismay when the room ended up looking like the inside of a child’s Easter basket. It was that awful green shade of fake cellophane grass. Went paint shopping the next day and had it repainted. Now it is a beautiful grey blue that I absolutely LOVE. Even the painters were relieved by the change! Your home is lovely by the way and this was a very interesting and informative post. You make me giggle! I know just how you felt! Yvonne, I love reading your posts and all of your stories (and listening to DTT!). 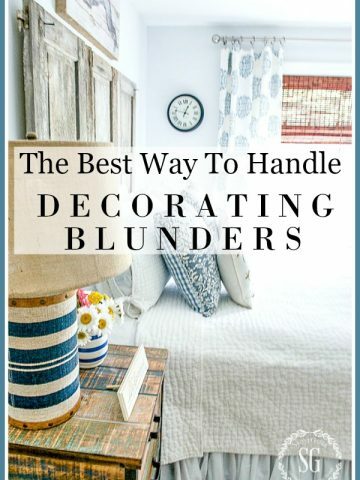 I was laughing to myself when I was reading about decorating mistakes. When we moved into our first home, a 1920’s 4 square, the kitchen had yellow painted cabinets with black fake wrought iron hardware, and the wallpaper! Oh my the wallpaper! Large, and I’m talking 6-8 inch, vegetables and fruits randomly placed with … coffee grinders! We were young and I was pregnant with twins so we lived with it for about 6 months and then did a “fantastic” update! We couldn’t afford new cabinets so had them refaced in medium oak, and then dove into the popular trend of the day, country blue and white thin striped wallpaper with… a country goose border! Do you remember that trend? The goose with the cute blue ribbon around its neck? And I bought a goose canister set, made and painted a white goose wood welcome sign and had white eyelet curtains! I feel for the people who had to change all that when we moved out 2 years later. Btw, we have NOT put wallpaper in any of our homes since we moved out. EVERY room was coated in layer upon layer of old wallpaper! I remember those geese! Oh my! What were we ever thinking? This post came just as I’m trying to change things up. I decorated in the cream/brown phase ( 2006) and now want to change much of it to whited & cream. Fortunately, I bought neutral furniture so it is only curtains and small decor items. I’m thinking of painting some things gold that are bronze but can’t seem to get my courage up. This post might just give me the push I need. Yvonne, I so agree with most everything you said except this: There may be people who love pepto bismol pink walls (I don’t) or love the Tuscan colors. 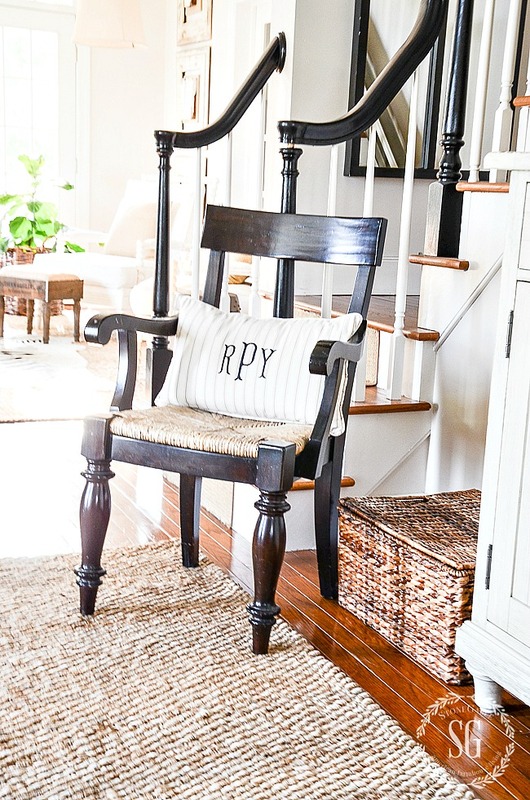 Let’s face it, farm house décor on all the blogs is a trend as well. 10-15 years from now everyone will be installing wall to wall carpet again, wall paper is already coming back, and most likely shiplap and burlap will have seen it’s day. That’s just the nature of decorating. For those who love to be creative, like you do, things will always be changing in some way, right? I just want the people with pink walls or Tuscan colors, not to feel put down because they still love a certain color or style. Our homes are that….ours….what makes us happy and those we love. But I do love your encouragement to not be afraid to try something NEW, or to make changes. We all need that encouragement. Let’s face it, our homes, however beautiful we make them, will not go with us to Heaven, but those we love well within their walls are the most significant investment we can make, which may not leave a lot of time and money for decorating. I just needed to say this. I so agree, Toni! Also, not everyone has the $$$ to correct a mistake. I think we can all relate to this post. We built our house 12 years ago and if I had to do it again, I would make several major changes. I don’t know if it’s getting older or what, but I want simplicity in my home. We can always learn from our decorating mistakes. I can so understand you with the decorating mistakes. The rooms in my house use to be all different colors. I finally went back to one color, a dark tan with white trim on the main floor, with plenty of black. I LOVE IT! Easier to decorate and add pops of color. Finally realized 5 years ago that I love dishes! White especially and all kinds. It is fun to decorate. Thank you for all your helpful hints and I love your decorating styles. GREAT TIPS! I’m a professional interior designer and believe me, I make mistakes. Design is an art with a little science thrown in (measurements are objective no matter how badly we want that oversized sofa to fit). I ALWAYS tell clients to get paint samples and watch them throughout the day/evening. And please, if the color doesn’t work, change it immediately. It’s better to get it right than to just get it done. I’m sure we can all identify with your post today.We are in the process of finally getting a new kitchen and I have agonized of each and every detail hoping to make the right choices I can live with forever.Keeping it simple and hope it all come together. 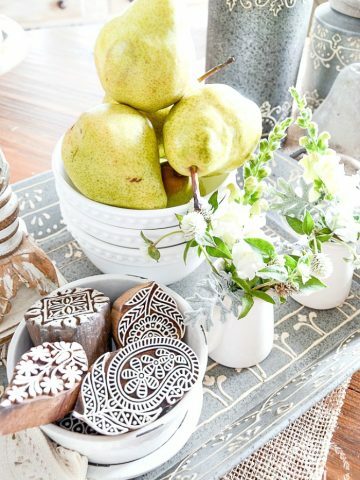 Believe me you are in good company when it comes to decorating faux pas! I have made my share of mistakes especially with paint colors. I learned the hard way that just because a popular paint color looks great in someone else’s home doesn’t mean it going to look the same in your own. As you said, you have to listen to your home and its style. Going too far in one direction style usually doesn’t work. I love to add summer elements in my home in the warmer weather for a light and airy feel but going too beachy or coastal just doesn’t look right since like you I don’t live near the coast. I do like a clean, uncluttered look and try to mix my décor with both modern and vintage. Hi Yvonne! Your post couldn’t be more appropriate for what I’m currently going thru right now. We just spent 6 months and a lot of money with a wonderful carpenter who gutted our complete lower level. Everything is new and fresh and the layout is just right. I dealt with dust, inconvenience and had many sleepless nights making sure every detail was covered. To be finished now should be a relief. Should be. The gorgeous custom built wall unit that houses my husband’s giant flatscreen and takes up one complete wall is to me an eyesore because of a very dull, drab paint color. The doors were all sprayed professionally, the hinges and hardware are all in place and the doors have been balanced. I don’t even go down there because I cannot bear to look at it. It is the focal point of the room. I totally screwed up and my only way to fix this might be with a blindfold. The hubby would be furious if I put one more cent into this project. I’m good with a paintbrush, but this would require the tv coming down and all those hinges and doors taken off. I want to hear more about how you convince your husband that change is necessary, even if the paint is just barely dry. I can so sympathize with your Diane! I have done projects and just hated them. Right now I’m living with a stone backsplash that was a custom job and really don’t like it at all!!!!!! But, I’m living with it and being thankful for the kitchen I have until I can get new tile. But every single mistake I make teaches me something that I won’t do again and teaches me lots of things I can share with you. Can you send me a picture of your new focal point? Then I might be able to help. I’ve gone through different phases decorating my house too. I went on a couple mission trips to China and ended up decorating my house in oriental furniture and furnishings. That latest about 3 months. Then I went to arts & crafts style. I’ve also changed my summer decor to everything ‘beachy’. I live on a farm in Iowa! I am just finishing a complete remodel of my main floor. It is farmhouse all the way and I love it and it finally feels just right. Your posts re being brave trying new looks has motivated me. I will step out of my comfort zone and keep looking for sofa pillows with a pop of color! Enjoy this beautiful sunny spring day. I picked out over 60 pillows with so much style! Wow Yvonne! Reading this post bright and early this morning makes me want to drop everything and get to work transforming my home! However, today I’m helping my daughter prepare for a gender reveal luncheon that she is hosting tomorrow – our first grandbaby! Can’t wait! I’ve been following your blog for years (but never comment?) and now realize I pass your road every week shopping or visiting my daughters in Strasbourg and Lancaster, I love your home! Mary, congratulations to your daughter and to you! I had my first grandbaby not long ago and it changed my life! I am so so happy for all! Enjoy this gorgeous Lancaster County day!